What Makes DiarySpot so Special? Color schemes functionality has become a standard for professional themes. 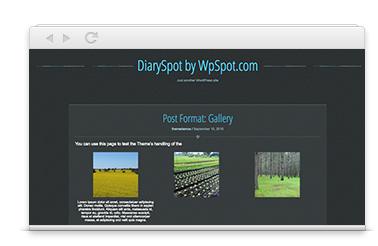 DiarySpot follows the trend dictated by WordPress users and offers you 2 stylish color schemes. Easy-to-use options panel allows you to select the scheme you want and customize the appearance of your website in seconds. We also are planning to release new schemes in the near future. Don’t miss this great opportunity and buy DiarySpot now! Professionally designed WordPress theme can make your website stand out from many blogs. But what makes it really unique is personalization. DiarySpot comes with features that can help you to attract attention and hopefully build successful brand for your web site. You can upload logo and banners, activate social media icons, and select excerpts or full posts. Still not convinced? You get FREE lifetime updates with more functionality in future releases. 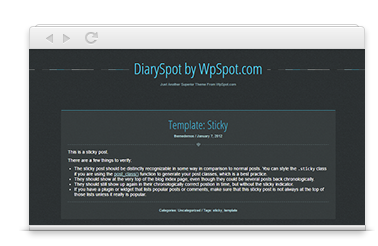 You can use DiarySpot on as many websites as you want without any restrictions. Stop worrying about compatibility and start enjoying DiarySpot. All standard WordPress widgets are supported. Create simple as well as complex great looking nested menus. WordPress menu functionality is fully supported. 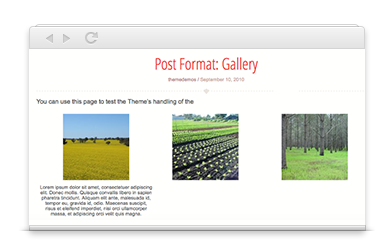 DiarySpot allows you to create gallery posts that display thumbnail and full-size images. Stylish comments section is crucial for effective audience interaction and converting visitors to constant contributors. 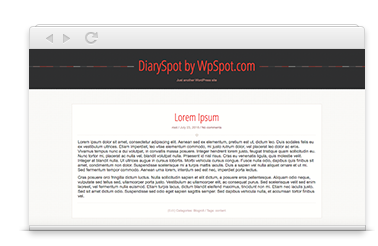 DiarySpot is built with localization in mind. You can translate DiarySpot into your language within minutes.